Our theme this month was Fright Night. We heard 10 stories - stories of frightening situations, near-death experiences, parents who traumatized their children with homemade Halloween costumes, and even one exorcism. Chris Diaz won with his story about his church community's feelings about a video game. Chris is pictured here with this month's host, Caleb Robertson. 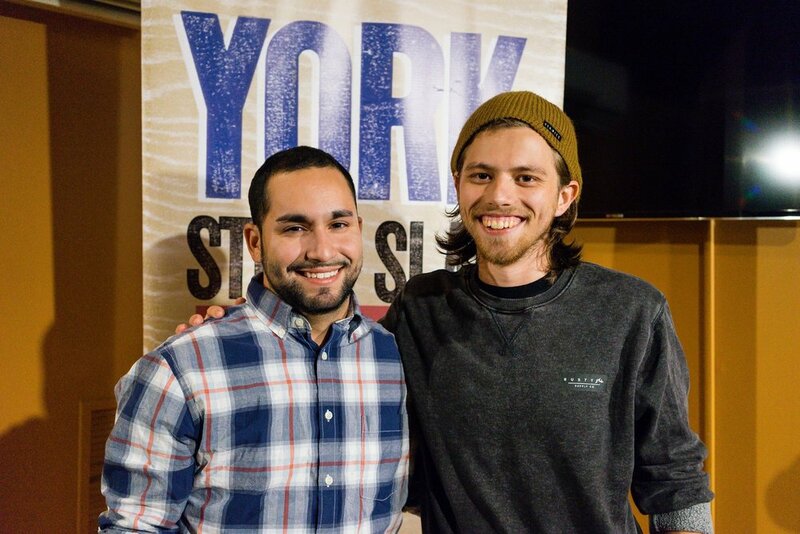 Chris won an exclusive York Story Slam journal from our friends at Story Supply Co. and earned a spot in our Grand Slam in November. We announced the theme for our 2017 Grand Slam: GLORY DAYS. We're excited to host it in the beautiful Capitol Theatre on November 21. Our MC for the evening will be our 2016 Grand Slam champion, Brad Jennings. Tickets are on sale now.